The gift-giving season isn’t quite over yet—we’ve got a whole lot of new features and products available to enhance your Alertus System! This release features our brand new Alertus Chromebook Notification solution—the first notification solution of its kind for Google Chromebooks. Built specifically for use by Chrome devices, this quarter-screen pop-up notification delivers critical information quickly to all subscribers, providing yet another effective layer of notification coverage as part of the Alertus Mass Notification System. 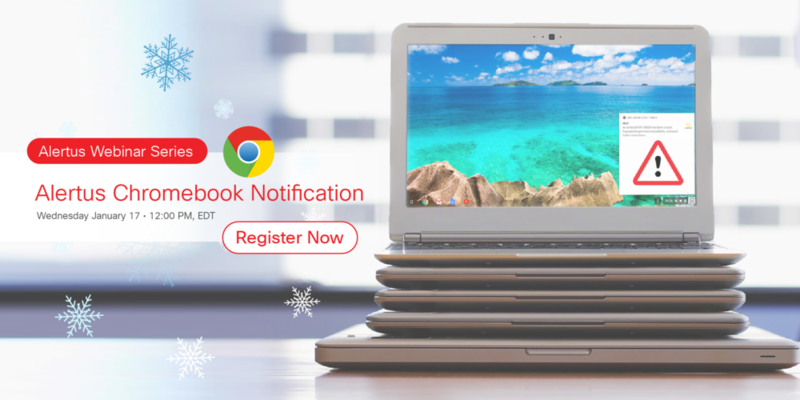 Join us on Wednesday, January 17, 2018 at 12 p.m. EST for a complimentary 30-minute webinar to learn how Alertus Chromebook Notification enhances your mass notification strategy. Click here to register today! Alertus customers can view all release features by logging into their customer portal at my.alertus.com. For more information on Alertus Technologies, visit www.alertus.com.